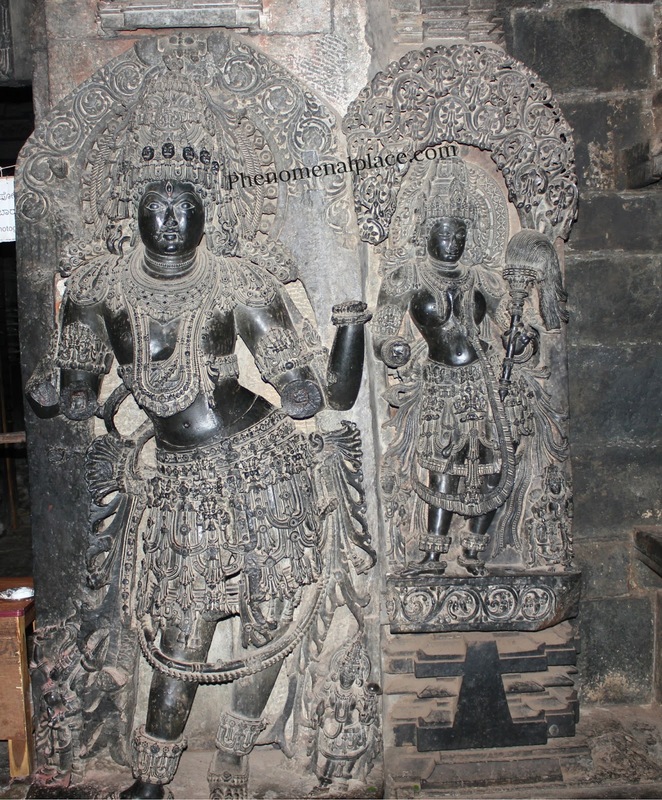 The Hoysaleswara Temple in Halebidu is an incredible structure built 900 years ago. I am going to show you some solid evidence of ancient machining technology in this temple. You can watch the video below, or read on. There is something very strange about these pillars. 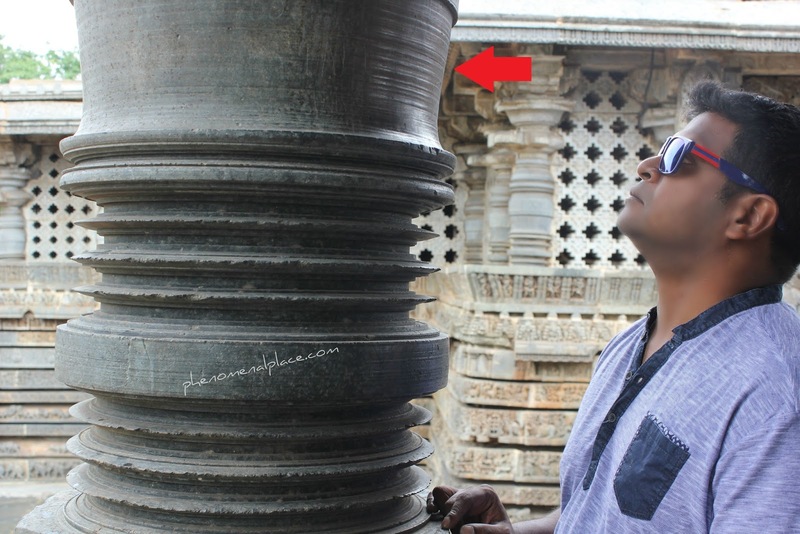 If you look closely, you can see these minute circular marks all around the pillar. These are created as a result of machining the pillar on a lathe, this process is called turning. There is no way to achieve this with chisels and hammers manually. If you look at these pillars, it is crystal clear that they were made with machines. In fact, archeologists agree that these pillars were created in a lathe, but offer no convincing explanation as to how these huge pillars were machined, 900 years ago. 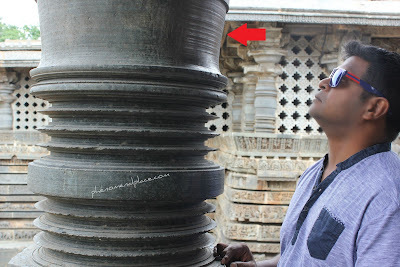 Nowadays, we are able to create these fascinating grooves and designs on a lathe, but machining a 12 foot tall stone pillar would be a very difficult job, even today. So, how were these pillars created with amazing perfection in ancient times? Did ancient builders use machines and advanced tools, just like what we use today? If this is true, is it possible that they also carved these machines or tools in this temple? 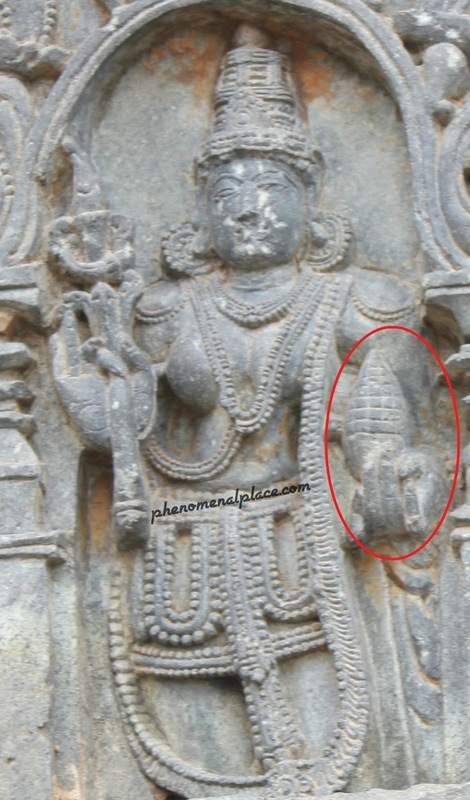 Above, you can see a very strange device in the hands of a god called Masana Bhairava. This clearly represents a type of gear mechanism called planetary gears. The outer Gear has 32 teeth and the inner gear has exactly half the number or 16 teeth, which is precisely how we use reduction gears today. 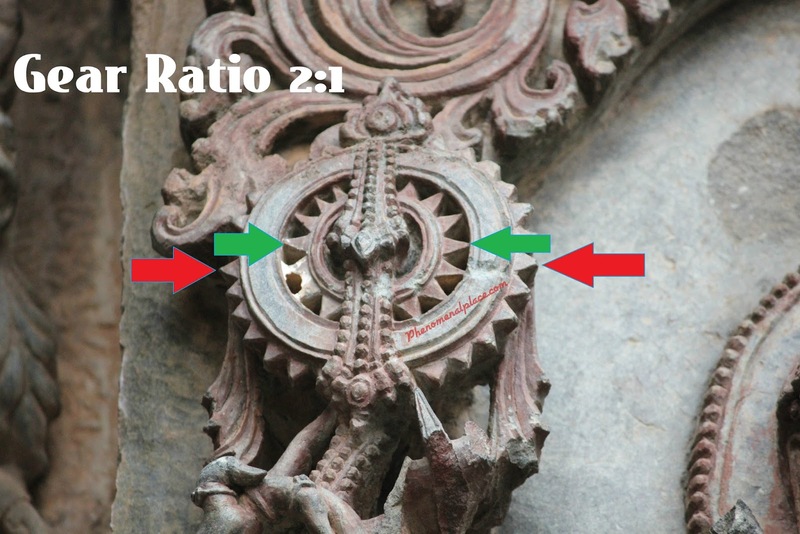 If this were just an imaginary tool, how could the ancient sculptors come up with this gear ratio of 2:1? Even more interesting, we can also see a fastener that goes around this mechanism and is locked in at the center. Today, we use the exact same technology, we use something called a circlip lock or a snap ring to keep these things in place. If historians are right, how could primitive people, working with chisels and hammers imagine such a mechanism? Is it possible that advanced machining technology was used 900 years ago? Is this why, we see such perfect pillars? What's more interesting is that this god is called Masana Bhairava (Masana = Measurement; Bhairava = God) which means God of measurement. Is it a coincidence that the God of measurement is holding an advanced tool? But the best evidence of machining is not on the outside of the temple, let us go into the deep dark areas of the temple and see if we can find more evidence. There is a 7 foot tall god, with the most uncanny ornaments. His crown is adorned with skulls which are less than one inch wide. I realized that I could pass a small twig through one eye and it would come out through the ear on the other side. The twig can also be passed from ear to ear and also ear to mouth, and any way you want. What does this mean? It means that the entire skull is hollow inside. It is impossible to remove the inside of a small sphere which is only 1 inch wide. Even with modern machines, this would be a very difficult, but we know for a fact that creating a hollow sphere inside of such a small rock is impossible with primitive tools. Even more interesting, we can shine a flashlight between his head and crown, and the light shines through. There is a very small gap between the head and the crown. I tried to slide the same twig which is about 3 millimeters wide, but it would not go through. This means that the gap is less than 3 millimeters wide. How could anyone create a small gap, less than 3 millimeters wide, with chisels? Is it possible that the small skulls, crown and other pieces were carved out of separate rocks and then fixed together? No! Archeologists confirm that this 7 foot tall figure is made of one solid rock. I've always wondered why the carvings in the darkest parts of the temple have the most intriguing details. Above is a woman who is wearing a large, thick necklace. However, if you shine a flashlight, we can see that this is not one necklace but two, because the light passes between the 2 necklaces. Again, I tried to put the 3 millimeter wide twig and it won't go between these necklaces. 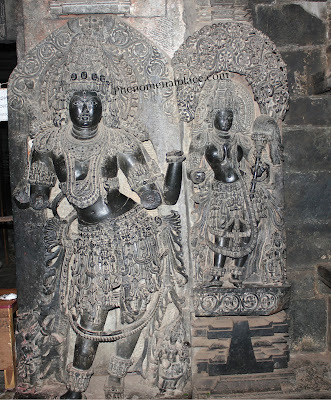 How do we explain these extraordinary sculptures made 900 years ago? 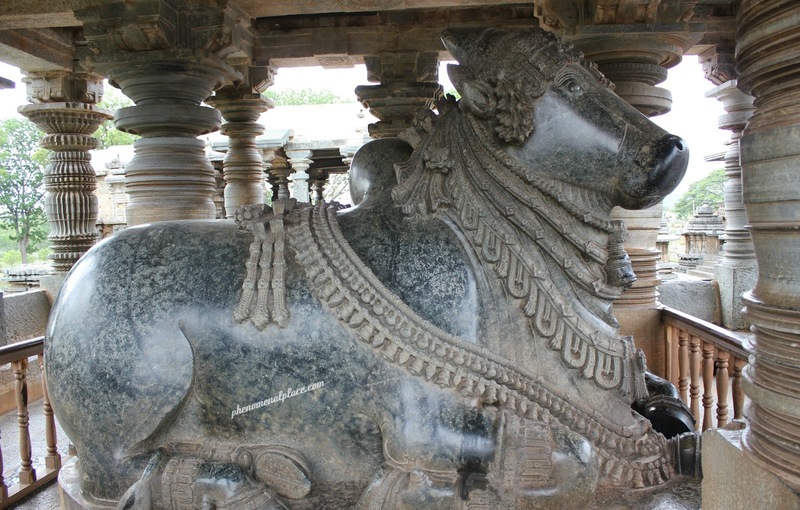 The Hoysaleswara temple is famous for housing the 6th and the 7th largest monolithic bulls in India. However, in terms of beauty, they are ranked first and second. This is because they look like they have been created with machining precision. 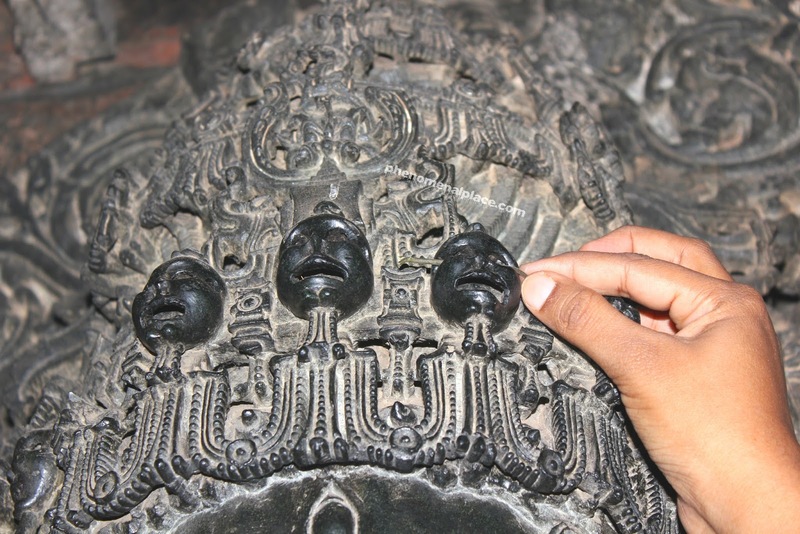 For example, look at the level of polishing, you can literally see your face, like a mirror, and this is after 900 years of corrosion and damage. So, you can imagine, how perfect they would have looked at the time they were created. Is it possible that this kind of polishing was done with machines? Today we use tools like the Rotary Burr, for this level of polishing. 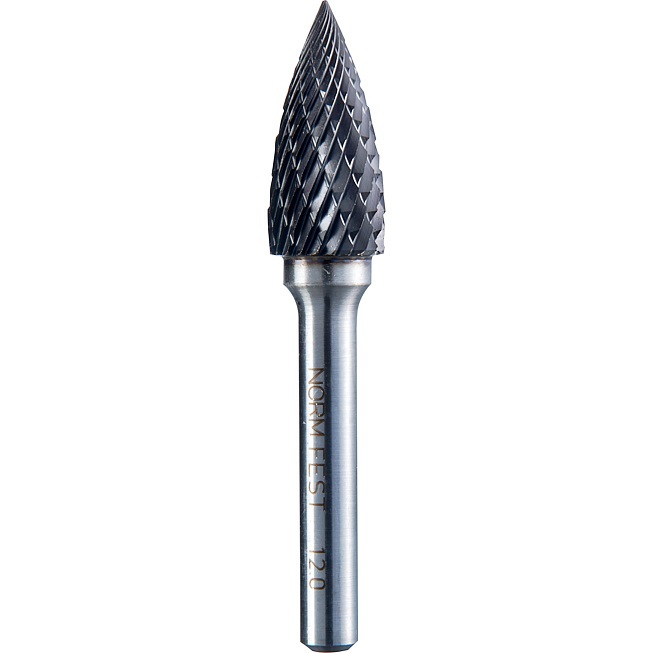 If you look at modern day drilling and polishing tools, they look like what you see below. Were tools like these also used in ancient times, and more importantly, are these tools also shown in the temple's carvings? Here we can see a tool that looks almost identical to the rotary burr, in the hands of a deity. Here is another one that is holding a slightly different tool. Note that the devices look the same, but are not identical, the ridges are different. 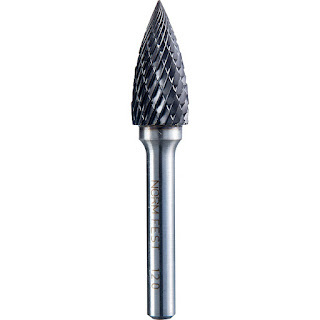 The drilling and polishing tools we use today, also have different ridges, for different types of machining. Around the world, we can see gods holding this mysterious tool that is thought of as pinecones. Are these really pinecones? 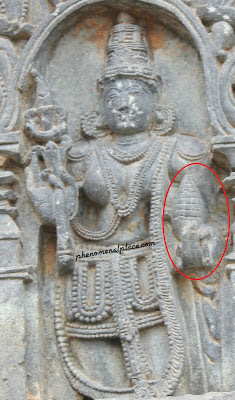 Is it possible that the gods in this Indian temple are also holding actual pinecones, and not tools? 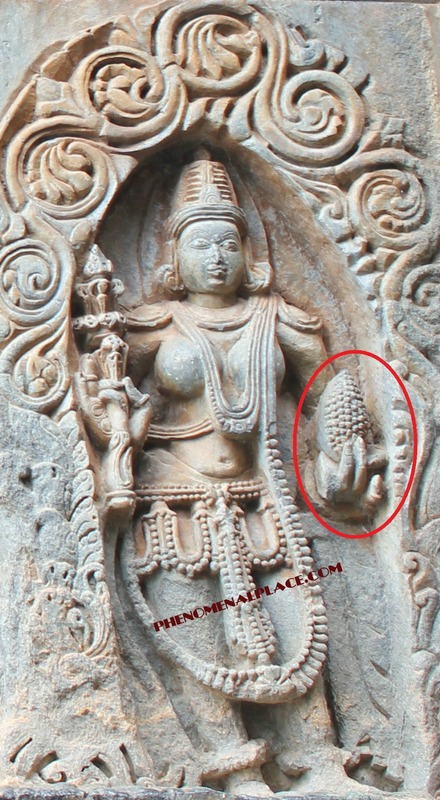 Well, there are no pine trees in India, so how could the ancient builders in India have seen pine cones 900 years ago? Since that is not possible, is it possible that these Gods shown around the world are holding an advanced tool that was used for machining technology? Is this how the world's greatest megalithic structures were built? Also many of these "pinecones" shown around the world are depicted with a long base, just like any modern day tool. 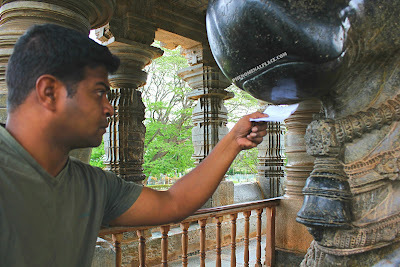 In a previous post, I have shown you a telescope carved in the same temple. How was this created without using machines? So, what do you think? Were advanced machines and tools used 900 years ago? If they were not used, how do you explain these turn marks and grooves, holes that are less than 3 millimeters wide and incredible polishing? What about these planetary gears and strange tools? Please let me know your thoughts in the comments section. I think that in coming years more and more scientists will come to the conclusion that there were in ancient times civilizations that were more advanced in technology than we are today. A lot of wisdom and knowledge has been lost in the past but will be discovered and find out again. Men will be in awe of our past civilizations and have to confirm that there is no linear evolution from caveman to our present state. Very interesting! Thanks for sharing. While it possible the pillars were turned on some sort of turn table, I think it is more likely they had a grinding tool that spun around the pillar, and had some sort of height adjustment. This would likely have used elephants or oxen to power it. I imagine evidence could still be found in the location this was done, as a circular path or impression in the ground would be left from the animal's path, and possibly some remnant in the center of the path. Rich Indian Heritage. You made it so interesting Thanks for the video which will surely inspre and attract young people to take archaeology as a career which is otherwise considered as a last choice. Your video is fascinating. I notice that near the top of the pillars, There appears to be a threaded collar with four equally spaced protrusions and above it, a spiral cut it looks remarkably like a giant screw jack. There were only a few images of this section of the pillar, but that is certainly the impression it gives. What do you think? What a pity no images of the surfaces behind the necklaces are provided.It is unlikely that the sculptors would expend much energy concealing tool marks in such areas as would not be seen, any tool marks there will reveal the nature of the to employed and will also have been somewhat protected from erosion. Beyond conjecture what do the existing tooled surfaces tell us of the tools employed by these extraordinary stonemasons? Your doing a great job! So maney keys to the past are in India. Thanks for your work !! Thanks for the beautiful article. However, it is respectfully submitted that according to Wikipedia (https://en.wikipedia.org/wiki/Pine and https://en.wikipedia.org/wiki/Northeast_India-Myanmar_pine_forests) pine forests do exist as a subtropical coniferous forest ecoregion in the mountains of northeastern India and adjacent portions of Myanmar (also known as Burma).These pine forests of Northeast India and Myanmar are examples of a habitat that is rare in the Indomalaya ecozone. Tenasserim pine (Pinus latteri) is the dominant species at lower elevations, sometimes associated with dipterocarps. At higher elevations, Khasi pine (P. kesiya) and blue pine (P. wallichiana) are the predominant species, associated with other evergreens including hemlocks (Tsuga) and firs (Abies), and broadleaf trees, including oaks (Quercus) and maples (Acer), while Rhododendron, Ilex, Prunus, and bamboo (Arundinaria) are common understory shrubs. Pine Forest also exist in Vagamon, Southern Western Ghats, Kerala (India). Fascinating point of view.I look forward to more such thoughts.